As the year comes to an end, it is time to look ahead to see what the next year will bring us. Last year, I predicted that 2018 would be the Year of Transition and a lot has happened indeed. The crypto market crashed with 60% since its peak at the beginning of the year. In addition, as I predicted, a new approach to data ownership is coming with Sir Tim Berners-Lee’s launch of Solid PODs. Now for the 7th year in a row, I offer you my two cents on the most important technology trends for 2019 to help you, and your business, prepare for the next year. As we approach the end of the second decade of this millennium, technology is evolving faster than ever before. These exponential times will have a profound effect on what it means to be human and how we manage organisations and societies. However, there is one common denominator among all the changing technologies; they all create data, in vast amounts. Data will determine the next decade as well as how good you are in storing, analysing and using it. Naturally, blockchain is part of my list of technologies for 2019. It has been on my list in one form or another since 2015. The difference with previous years is that in 2019 we will see the first real enterprise applications in use. I am not talking about the various blockchain startups developing decentralised Applications (or dApps) nor am I talking about Proof of Concepts. In 2019, I think that we will see large corporations using blockchain to improve industry collaboration. These enterprise applications will predominantly use private blockchains. Within these networks, new actors have to be approved by existing participants, enabling more flexibility and efficiency when validating transactions. Organisations that will prefer to keep a shared ledger for settlement of transactions will be in the financial services industry or within supply chains. Especially for the latter, I see tremendous opportunities for 2019. In 2019, blockchain will become the gold standard for the supply chain. Simply because it offers clear benefits for participants in a network that have to trust each other to make it work. Thanks to distributed ledger technologies, we can create supply chains that are resilient, transparent and effective, enabling trustless transactions among industry partners. 2019 will see real-world examples of organisations collaborating and improving their supply chain using blockchain. These use cases will trigger other organisations to follow suit and as a result, in 2019 blockchain will move from Proof of Concepts to production-ready solutions. Apart from enterprise blockchain solutions, I foresee another shift for blockchain’s main application; cryptocurrencies. Last year, we saw the rise and fall of cryptocurrencies. After a staggering increase of 3252% in 2017 (until January 8, 2018) we have witnessed a subsequent drop of 60% of the crypto market value in 2018. For the past years, what happened was that when Bitcoin rose or fell, the entire market rose or fell. However, this will change next year. I believe that in 2019 we will see some stabilisation among token prices and a modest increase in value. Yet, this will only count for those cryptocurrencies that are linked to a real product. Only those cryptocurrencies that have a raison d’être will remain relevant in the coming years. This will also mean that we will see a decoupling of bitcoin and the other cryptocurrencies. As I have said many times before, I believe Bitcoin will fail as it is fundamentally flawed. Apart from being the first cryptocurrency (we all know how Myspace ended), there is no real use case for Bitcoin (simply because there are already better alternatives). Already, in 2018 we saw a massive drop in Bitcoin retail payments. Where the value of Bitcoin will continue to fall in 2019, the value of those cryptocurrencies linked to a real product (with a strong development team and growing customers base) will start to increase. Next to the decoupling, 2019 will also see a stronger focus on tokenomics. Token economics is an emerging field that studies tokenised ecosystems. With the rapid adoption of tokens, it is a field that becomes increasingly important. Tokenomics is all about how your token will work when the token has been launched through a Token Generation Event (TGE). In 2019, it is likely that many universities will start to offer specialised degrees to help future leaders understand the economics of tokens. In addition, startups that want to do an initial coin offering will be required to provide clear insights into their tokenomics if they want to be successful. For years, we have been promised advanced virtual reality and useful augmented reality. However, the hype of Pokémon Go has passed, and Google Glass never made it into full-scale industry adoption, although it is getting smarter. Moreover, virtual reality is still predominantly used for fancy marketing demos. Nevertheless, R+ (Virtual, Augmented and Mixed Reality) continues to fascinate organisations and consumers and the introduction of Magic Leap, after some initial mockery, seems to slowly offer some real magic. In 2019, it looks like R+ will slowly start to live up for its promise. This is due to two components that are rapidly improving: hardware and software. First of all, Graphics Processing Units (GPUs) have experienced a sharp decline in costs (partially due to the crypto mining craze in 2018) and sensors and tracking systems have become more advanced, smaller and cheaper. On the other hand, artificial intelligence and machine learning offers content creators tools, such as advanced rendering systems, to create superb content. At first, augmented reality will take off in the business space. The number of possible applications for AR in organisations is virtually limitless; ranging from assistance during operations in hospitals to fixing complex manufacturing systems. AR will provide workers with a useful overlay, helping them in the job at hand. With AR systems becoming cheaper in 2019, more organisations will start to experiment and implement AR systems within their organisation. On the other hand, virtual reality will be geared toward consumers, although the adoption rate will be lower. Virtual reality simply requires more processing power, better rendering and above all, a solution against nauseousness. No doubt, in the future we will not be able to distinguish virtual reality from reality, offering fascinating opportunities, but that is not in 2019. 2019 is the Year of Truth, which is especially true for connected devices. Despite the massive DDoS attack using IoT devices in 2016, organisations have not learned. Back then, hackers turned to unsecured IoT devices to create an extensive botnet, so they could push enough traffic to take down Dyn, the DNS provider. In the past years, we have seen hacked baby dolls, hacked baby monitors, hacked thermostats, hacked printers and even hacked cars. The list goes on and on. With the number of connected devices growing rapidly, this is a problem. A world full of connected devices and autonomous things has the potential to be a dangerous world. Not because all these robots, drones, vehicles and connected fridges will turn against us, but because most likely many of these products will have weak security. Security is not a core competence for IoT manufacturers and, as such, hackers will always have an unfair advantage. I believe that in 2019, hackers will exploit connected devices to create a new, global, attack on internet systems. The only solution will be to force producers of IoT devices to improve their security efforts. Since this will cost them money, they will be reluctant to do so. As such, governments have to step in to develop regulations that will require IoT manufacturers to implement a minimum level of security. Most likely, the 2019 global IoT security breach will be the driver for many governments to develop such legislation. Unfortunately, it would have been better if this would have been done before. Fortunately, there will also be some good news when it comes to data security. 2019 will see rapid advancements in AI Security, and with that, AI will become an important team member of the IT security department. However, there is also a catch. Not only cybersecurity experts will use AI, also hackers will do so. As a result, it may be so that soon we will have AI systems in charge of cyber security and hacking. For the past years, we have seen rapid developments in multiple technologies. Big data analytics has moved from descriptive analytics to prescriptive analytics. Blockchain has moved from the ‘traditional’ bitcoin blockchain (often referred to as blockchain 1.0) to blockchains that focus on smart contracts (Ethereum, often described as blockchain 2.0), blockchains that are not a blockchain at all but instead use a Directed Acyclic Graph (IOTA, seen as blockchain 3.0) or blockchains that use a delegated consensus mechanism (EOS, also known as blockchain 4.0). Finally, AI is moving towards Intuitive AI due to deep learning and advanced machine learning. To benefit most from these emerging technologies, organisations need to datafy their business. Datafication refers to turning analogue processes and customer touchpoints into digital processes and digital customer touchpoints. In 2019, we will see an increased focus within organisations to digitally transform their business. Consultancy firms, event organisers and freelancers will jump onto the massive opportunity to help organisations move from product companies to data companies (such as the company Kaeser Compressors who now offers Air-as-a-Service). 2019 is the Year of Truth for many organisations if they wish to remain relevant in our data-driven world. Organisations will start to see this as well. Those organisations that will take datafication serious and start to combine different technologies within their business will be able to compete in the fast-changing environment. 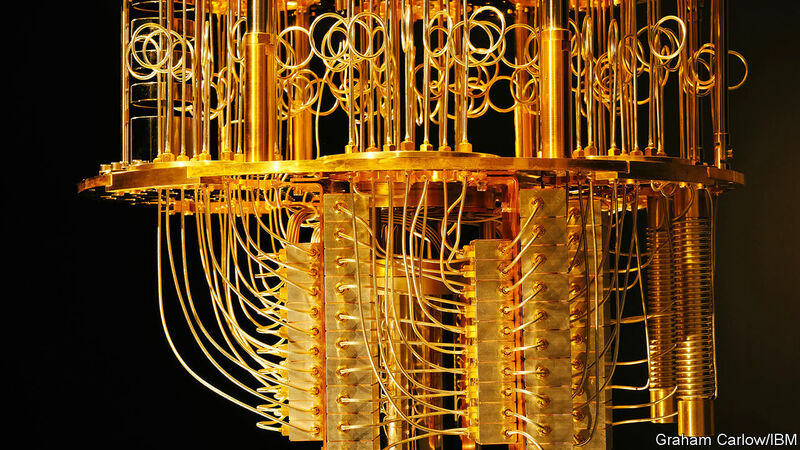 For a long time, quantum computing was the stuff of science fiction. However, in recent years, organisations and governments have increased their efforts to build the first full-working quantum computer. In 2018, Google confirmed a 72-qubit quantum computer, while IBM has a 50-qubit computer and Intel a 49-qubit computer. The Pennsylvania State University even announced that they have built the framework for a 125-qubit quantum computer. Quantum computers are here, and developers can build and run quantum computing applications in a cloud environment. In 2019, the developments of quantum will increase significantly as the organisation or country that will build the first fully operational quantum computer will have a significant advantage over the competition. Next year, the arms race among countries and commercial organisations will intensify. At least one organisation will come close to quantum supremacy and maybe even achieve it (but subsequently not talk about it for obvious reasons). Quantum computers offer a serious challenge for security. First and foremost, because a fully operational quantum computer will be able to break the standard encryption used today across the globe. If that happens, any data that is currently encrypted using standard encryption algorithms will become accessible. A huge problem and a challenge that is a lot bigger than the Y2K bug in 1999. The only way to prevent chaos is to start using quantum-resistant encryption. Unfortunately, the vast majority of organisations even still lacks normal encryption (let alone have quantum-resistant encryption). Maybe, in 2019 we will see the first quantum-computing enabled hack. If that happens, we should brace ourselves. Artificial intelligence is being developed at record speed. From beating human players in the game of Dota 2 to modelling the complex folding patterns and predicting the structure of proteins. In 2019, we will see a lot more scientific breakthroughs thanks to ever-advanced forms of artificial intelligence. Most likely, impressive AI innovations will be reported faster than ever before. This is partially due to the flood of data that is now available to train algorithms. The common denominator in all new technologies being developed is that they create vast amounts of data. Especially China will benefit from the availability of this data, simply because they have less stringent privacy laws when it comes to data. As a result, in 2019 I believe that China will make a significant push forward in terms of AI development, potentially leaving behind the USA (and most likely leaving the EU far behind due to the lack of common AI strategy within the EU). Unfortunately, all this data will also cause problems, as often the training data is biased data resulting in biased algorithms. In 2019 we will also see an increase in new machine learning techniques. Algorithms that learn by playing against itself (such as was the case with, for example, AlphaGo Zero) will become more common. Reinforcement learning has proven a successful technique to develop ever more advanced AI. However, we will also see new machine learning techniques that will lead to new and improved AI. Recently, Uber turned to such a new machine learning technique. Developed in Uber’s AI Lab, the new algorithm uses a new type of memory, by returning to a previous task or particular area to see if it can provide better overall results. Such new techniques will help researchers solve more video games that are perceived difficult for AI and will significantly advance our AI knowledge. 2019 promises to be an important year for the development of artificial intelligence. Next year will be an exciting year, and a lot of new developments will occur. We now live in exponential times, where the development of new and the advancement of existing technologies will speed up significantly. Organisations will start to develop production-ready blockchain solutions, especially for supply chains, while we will see a decoupling between Bitcoin and Altcoins. We will see a division among AR and VR; Augmented reality will increasingly be used to improve enterprise applications while virtual reality will be geared more toward the consumer market. Unfortunately, despite a lot of good news, 2019 will also experience a massive global data breach caused by unsecured IoT devices. Hopefully, this will lead to legislation forcing IoT manufactures to improve their security. Next year, we will also see more organisations starting to combine various emerging information technologies such as AI, blockchain and analytics. When they do so, they will experience a gestalt shift and see their organisation from a different perspective. Those organisations that successfully follow this path will transform into data organisations. Finally, we will see significant developments in quantum computing and machine learning, resulting in new and improved applications, but unfortunately also an intensified arms race. As a result, 2019 will be the Year of Truth; not only from a blockchain perspective that offers industry partners a single version of the truth but also in terms of IoT security and the intensified arms race among governments and commercial organisations. All in all, it will be a very exciting year as we prepare for a data-centric 3rd decade. What do you think of these seven technology trends for 2019? Anything you want to add? Please join the discussion in the comments below. If you want to download the presentation of the seven top technology trends for 2019, click here.